The latest issue of our NZCCSS newsletter, Kete Kupu Number 13, is now online on our website. Significant inequalities between Māori and non- Māori remain and have increased in the period 1981 – 2006 despite important gains for Māori in some areas. This is the nuanced picture presented in the report “Trends in Wellbeing for Māori Households/Families, 1981–2006”. Important gains for Māori households came through reducing crowding, improved secondary educational attainment and some types of household increased their incomes. Given the wide and current interest in whānau ora, the report is a timely contribution allowing more informed public policy development around Māori whānau/households wellbeing. Does Inequality Matter? A Policy Forum, (Tuesday 16 November 2010 Rutherford House Lecture Theatre 3) Keynote Speaker is Professor Richard Wilkinson, a distinguished British social epidemiologist and co-author of The Spirit Level: Why Equality is Better for Everyone .In addition to Professor Wilkinson, the forum brings together a number of leading New Zealand academics, researchers and policy analysts with expertise on the many and varied dimensions of inequality. More information on the IPS website. Labour Deputy Leader Annette King has announced what she calls a “new direction” in Labour’s social policy. This includes setting targets to eradicate child poverty, a focus on supporting parenting and child care in the early years (0-5 years of age) and a real focus on designing income support policy that is focused on training and education for sole parents backed up with quality childcare. While the details are still to come, you can read her speech Putting Children First on the Labout Party website (see link above). New Zealand Institute that shows how the burden of inequality and poverty in New Zealand falls on our children. 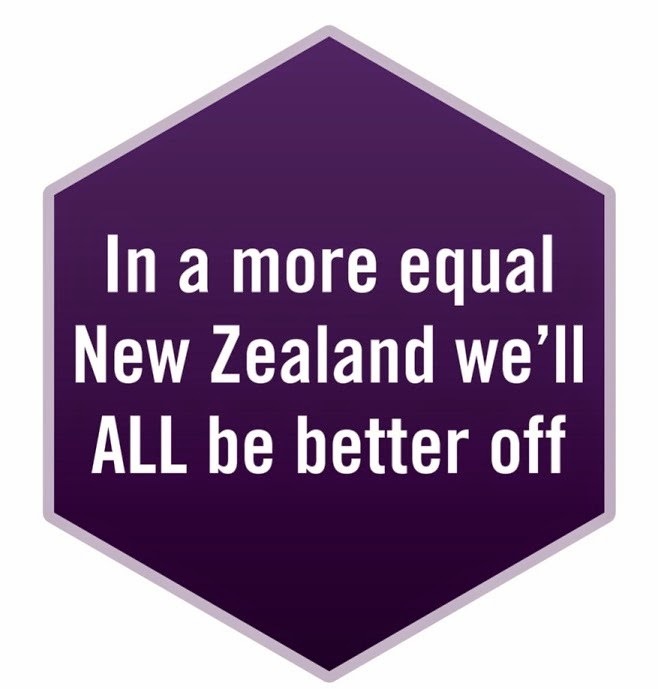 According to the NZ Institute information on Inequality - New Zealand’s children suffer not only a higher rate of hardship than other New Zealanders, but a greater share of New Zealand’s children face hardship than in many other countries. New Zealand’s older population faces a low rate of hardship relative to the other New Zealand age groups and relative to the same age groups in other countries. Having about one out of every five children facing hardship is a situation that must be improved. The comparison to other countries shows that New Zealand is unusual in choosing to impose such a burden on the youngest segment of the population. Residential Aged Care into the Future – The need will be there. How will we respond? A seminar/workshop for non-profits Wednesday 3rd November 2010, Selwyn Village, 43 Target Street, Pt Chevalier Auckland . The population is aging. Can we do better with the resources we already have in the sector? How can we improve collaboration? How can we improve clinician leadership? Responding to the recent release of the Aged Residential Care Service Review, the Selwyn Foundation is inviting non-profit organisations to attend this workshop. Contact trishp@selwyncare.org.nz to register. The Government’s much heralded and long awaited Gateway Housing scheme has finally been launched. The scheme means people will be able to buy or build on land while deferring payment for the land for up to ten years. This means lower income families can focus on buying their home before having to meet the costs of buying the land. Details are at HNZC website. As the Greens were quick to point out, with up to 20,000 households with extreme housing issues, the 30 new homes that this scheme will deliver will be a drop in the ocean. A public meeting is to be held in Porirua to gauge interest in forming a steering group to work to establish an Abbeyfield house in Porirua. The meeting will be held on Thursday 21 October 2010 at 7.00pm at Ground Floor, Pember House, 16 Hagley St, Porirua. Australasian Housing Researchers Conference is coming up on 17-19th November in Auckland, featuring Professor Duncan Maclennan, an international expert on the development of cities, the renewal of neighbourhoods and the economics of housing, David Thorns, whose research interests include home and identity, housing policy, urban sustainability and globalisation and Kay Saville-Smith, Director at CRESA specialising in applied social research and evaluation in housing, public policy and community development. Book and pay the early-bird rate (3 weeks before) to get the 10% discount. How About some Principles and Ethics? For those of you who tire of the cynicism of politics, a timely publication will help you think about ways to apply principle and ethics to public policy. Public Policy: Why Ethics Matters (editors Jonathan Boston, Andrew Bradstock & David Eng) is the “book of the conference” hosted by the Institute of Policy Studies in Wellington on December 2009 and it is available free online. This book covers amongst other things, some foundational issues, the ethics of policy analysis and advice giving, the ethics of climate change, and economics and ethics. Hard copies of this book will also be available in due course from the ANU E-Press and the IPS. The editors are also planning a second book due out in early 2011 including aspects of justice and public policy, measuring progress, and sustainability issues. Keep an eye on the IPS website for more information. Income splitting – a really bad way to use $500 million of taxpayer money. With gritted teeth no doubt, Finance Minister Bill English joined his National Party colleagues in voting for the first reading of Peter Dunne’s Income Splitting Bill. Part of the support agreement between Dunne and the National Party was that they support this legislation through to Select Committee. As we already have pointed out on a number of occasions see Policy Watch on 30th August and we think giving yet another tax cut to families already benefitting strongly from recent tax cuts and shutting out solo parents, low income earners or those benefits is a really bad use of $500 million. Submissions are due by 5th November, read about the bill on the Parliament website. Immigration Submissions open for 2010 ISSL and LTSSL second review. Immigration New Zealand has announced that submissions are now open for its second bi-annual review of the Immediate Skill Shortage List (ISSL) and the Long Term Skill Shortage List (LTSSL). The Head of Immigration New Zealand, Nigel Bickle, says that the same process is followed for each review. "Information is gathered from submissions made by external stakeholders and this is considered alongside economic, labour market and immigration data," Mr Bickle says. For details of the ISSL and LTSSL lists and submission guidelines go to the Immigration website. Go to the Law Scene website for legislation updates for the community and voluntary sector.